Caybeach Caleta is a three-star hotel that offers four-star facilities and serves to travellers looking for a remarkable seaside holiday in Fuerteventura, Spain. Its all-inclusive and self-catering accommodations are widely celebrated among couples and families from all over the world. The rooms at Cay Beach Caleta are absolutely marvellous, making for a memorable stay. The hotel houses a main restaurant that serves buffet breakfast, lunch and dinner. For those who want to have refreshing drinks after a tiring swim can take advantage of the pool side bar, which serves alcoholic as well as non-alcoholic beverages. Soak up the Canarian sun in the outdoor swimming pool, where you will also find sun loungers dotted across the pool. 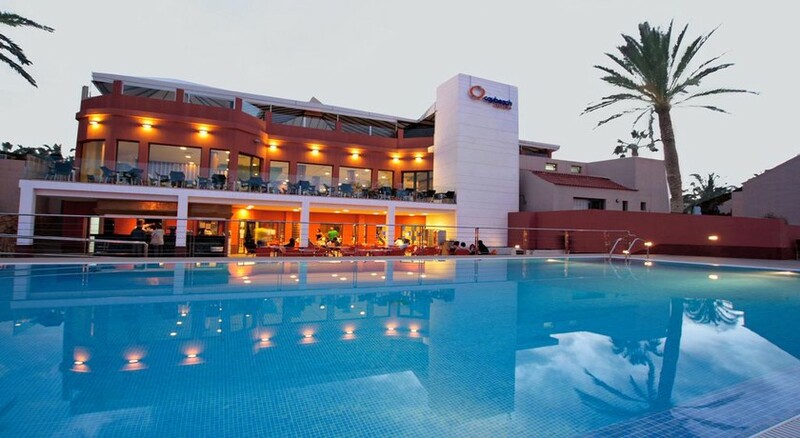 Caybeach Caleta is a family-oriented hotel located in Caleta de Fuste, the east of Fuerteventura. It will be an exciting stay for beach and water sport lovers, as the beach is only 350 metres from the complex. The main strip that is full of restaurants and shops is 300 metres from the premises, but in case you want to explore more of the locality, the shopping centre is about 3km away. The Fuerteventura Golf Club and Golf Salinas de Antigua are 2.4km and 4.8km respectively from the hotel. On the beach you’ll find several water sports activities suitable for travellers of any age. The Fuerteventura Airport is 7.8km from the hotel. 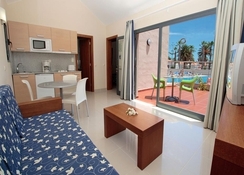 Accommodations in Cay Beach Caleta are divided into one bedroom and two bedroom apartments. Spacious and modern, standard facilities in the guestrooms include TV with satellite, air conditioning, heating system, private bathroom with amenities, hairdryer, telephone, full-functional kitchenette, separate dining room, dining table and chairs, Wi-Fi internet, safe deposit and balcony. Rooms are bright and beautifully decorated and offer different views of the surrounding. The main restaurant serves breakfast, lunch and dinner in buffet style. It brings to the table a wide collection of covers along with selected beverages—in case you’re on a special diet, do inform the hotel before your travel date, the staff are more than welcoming to accommodate your request. The hotel also houses a poolside bar that not only serves alcoholic and non-alcoholic beverages but scrumptious snacks and ice cream throughout the day. The hotel features an outdoor heated swimming pool with complimentary lilos, loungers and parasols. It also houses an outdoor children’s paddle pool. Kids between 4 – 12 years can join the mini-club where a variety of workshops and activities are conducted. Few popular recreational facilities include day entertainment, night animation, mini market, playground with slides and swings, billiards, mini golf, basketball, mini football, French bowling, indoor & outdoor discos, fitness centre with sauna, and board games. Good location.clean acommadation.good food.friendly staff.